In 2001 a Toxicological Report was conducted to verify the safety of Heatsavr™, the liquid pool cover - which is also the liquid inside of each Ecosavr™ liquid solar cover fish. The test was done as a Third-Party Study, and found that when the liquid pool cover was used as recommended, toxic risks of exposure were negligible. In fact, "Levels 30 times as high are permitted by the Food & Drug Administration in beverages consumed by bathers sitting around the pool." Moreover, a Ph.D toxicology consultant confirmed that, "at high concentrations (100%) the proprietary ingredient has a very low order of acute toxicity and is only minimally to mildly irritating to eyes and skin. In concentrations used in Heat$avr, it is my opinion that the proprietary ingredient would present no health risk to the general public." You can download read the full report through the link below. When you are considering the safety of using a liquid pool cover, you should also consider the safety implications of making a different selection in your choice of pool covers. As we have shown, Heatsavr and Ecosavr are completely safe when used as recommended; there are no safety risks. On the other hand, plastic solar bubble blankets have been proven to create risks of entrapment - a definite hazard for families with children or pets. 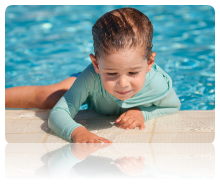 Also, studies have shown that covering a swimming pool with a conventional pool blanket may create a breeding ground for bacteria - another hazard to be aware of. When you choose a liquid pool cover, you are avoiding both of these dangerous risks. For more information, please watch the video below for a message from the Independent Pool & Spa Service Association (IPSSA) about pool cover entrapment dangers, and read the report from Allen J Wilson, Health & Safety Consultant at Studies in Work which discusses potential bacterial pollution from conventional plastic pool blankets.